How Much does Times Encounters Cost? If you’re a Times reader looking to meet a like-minded singleton aged 35+, Encounters Dating is for you. This online dating site has been created by the minds behind the Times and the Sunday Times and is a popular choice, it has more than 82,000 members on board all of which are a reflection of the Times audience, meaning they’re educated professionals with a vast assortment of sophisticated interests. Intelligent personality, lifestyle and interests balancing helps the matching system pair up individuals with their most compatible partners, all the while focusing on safety and anonymity. When you sign up for a free Encounters Dating account, other members will only be able to see your username – not your real name. How Much Does it Cost to Join Times Encounters Dating? *Note Whichever subscription you opt for, you’ll be charged for the full duration in one hit, so make sure you’ve got enough money in your bank to cover it if you’re paying by bank transfer or debit card. BE WARNED Just before your paid subscription expires, it will automatically be renewed at the price you originally paid. Chances are, there could be a better deal available when you’re ready to renew your subscription. With this in mind, we always recommend turning off the automatic renewal service and renewing your subscription manually if you want to when the time comes. To cancel the automatic renewal, log into your account on the Encounters Dating website, visit the status page and click on the cancellation link. TOP TIP – If you know someone who has a paid subscription on Times Encounters, you can ask them to send you a three-day subscription gift. This gift costs £7.50 and gives you a small taster of the site’s potential, without leaving you seriously out of pocket. What Do You Get from Times Encounters For Free? 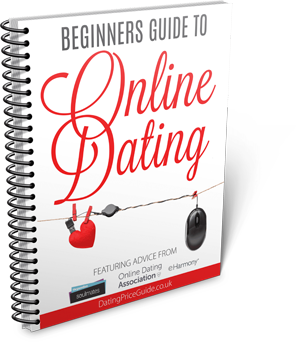 If you’ve chosen to use Encounters Dating to find your perfect match, you’ll need to create a free account first. You can type your details into the boxes provided or save a few seconds and join with your Facebook account. Encounters Dating promises not to post anything on your timeline, so you don’t have to worry about your friends finding out. When you’ve provided your info, you’ll need to log into your email inbox and click on the link to confirm your email address. When you’ve confirmed your email address you need to bulk out your account, starting with who you’re looking for and where you live. When you’ve done that, you’ll be invited to add some info about yourself, including what you look like and some details about your lifestyle. There’s a handy progress bar at the top of the page which shows you how far you’ve come and how far you’ve got to go to spur you on! Then it’s time to decide what you’re looking for in a partner and how important each characteristic is. For example, whether you’re determined to go out with a Capricorn or couldn’t care less which star sign your potential matches are, you can specify all this in this section. Now it’s time to really sell yourself and give your profile a headline, a small piece about why people should bother getting to know you and a description of your ideal match. After you’re done bigging yourself up, you can add a photo. Although you don’t have to add one, your chances of being contacted by someone else are significantly higher (we’re talking 1000% here) when you’ve got a photo, so add one. If you don’t have a suitable photo on your computer, you can pull one from Facebook or Instagram. Finally, you can fill out even more details about yourself in the ‘More on me’ section. This part is totally optional, but if you really want Encounters Dating to find you a perfect match, it’s definitely worth doing. 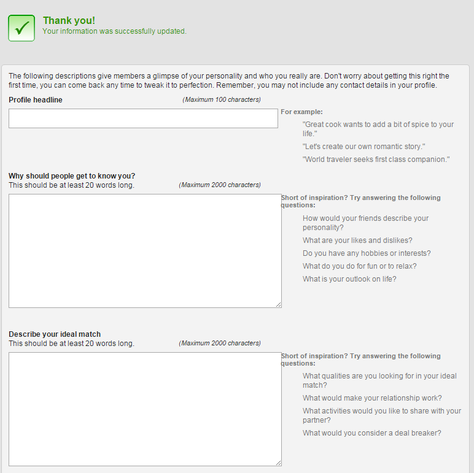 Depending on how in-depth you fill out your profile, you can spend anywhere from 10 to 30 minutes completing the questionnaire. Remember that you can go back at any point to change/improve/delete parts that you’ve filled out, so don’t feel rushed to get it right first time. You can start using the site straight away with your free account, or head to the homepage and click on the ‘subscribe now’ button to upgrade to a paid subscription. If you’ve got a discount code, make sure you click on the grey ‘Have a voucher code?’ link and type it in if you want to get the best price. 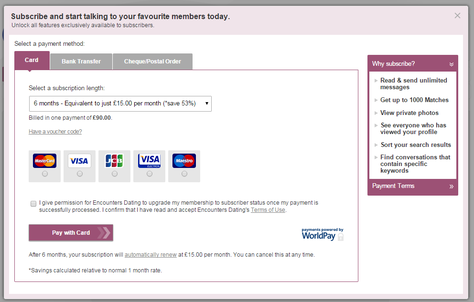 Then choose which membership you want, how you want to pay and follow the instructions on screen. Sometimes I will add details of a Times Encounters free trial here when there is one available, at the minute there doesn’t seem to be one live. You can sign up to my newsletter where I will send you an email as soon as a new code is live or take a look below for the best and most recent Times Encounters promotional codes and discounts. Warning: If you do take out a free trial, be sure to cancel the auto renew otherwise your membership will get auto updated to a 1 month plan, which is not great value. All f the below codes will need you to click through and complete your profile before they will work, if you are having any trouble, feel free to drop me an email and Ill be happy to help in anyway I can. If I don’t have a live Encounters Dating discount code then sign up (with a new account) using one of the links below and you will qualify for a small cash back offer via DatingPriceGuide.co.uk. 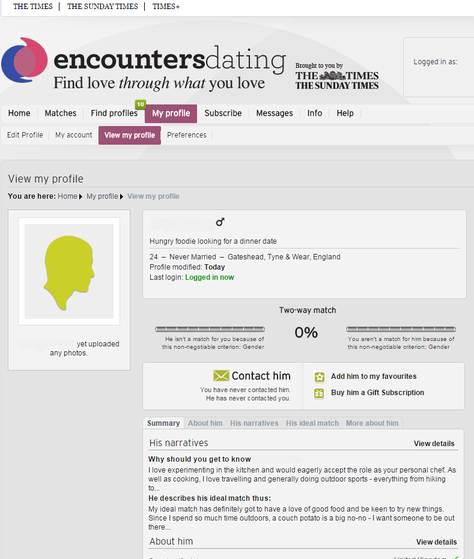 *EXCLUSIVE OFFER* Join Times Encounters Dating through DatingPriceGuide.co.uk & receive a free gift. Sometimes Times Encounters Dating sends emails out to their free account holders with strong paid subscription deals. If you don’t want to miss out on a potential bargain, check your email preferences on the Times Encounters site OR you could sign up to my newsletter and Ill email you the best discounts from all the dating sites when they are live. 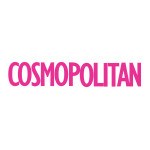 Not only that – but your friend will also get a 20% discount code they can use to save on their paid subscription. Everyone wins! To refer your friend, you need to visit the ‘Tell a friend’ tab on the Times Encounters site and follow the instructions there. If you are a member of Times Plus then you are eligible to get 50% off of a 3 month membership by visiting your MyTimes account and redeeming the offer – you will then receive a promo code to use on the site. 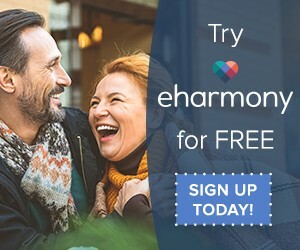 Do you have discount codes please for Encounters/ Guardian Soulmates/ EHarmony?